My first ride yielded some very noisy data. So I decided to use a Turbo Trainer to take out the road bumps. Then I started thinking about the theoretical power requirements and how my stationary trainer stacked up against these numbers. 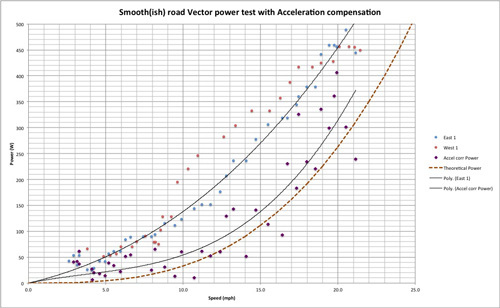 What the graph on the right shows are the power requirements of the rider for various road gradients through the speed range. 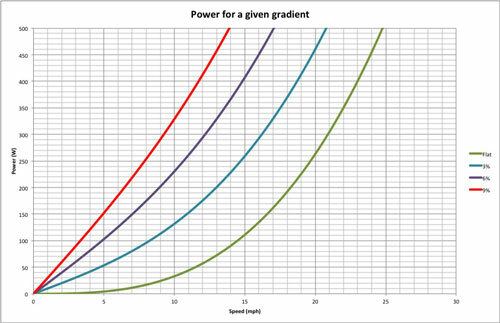 What this graph shows is the stationary trainer data at it's maximum and minimum resistance levels overlayed with the flat and 3% gradient theoretical power lines. 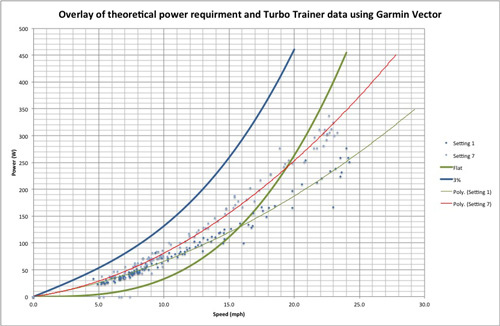 The fit of the Garmin data is a second order polynomial. The raw data is stored in a .fit file which can be downloaded from the Edge head unit or exported using Garmin Connect then converted to a .csv fit using a Java routine called FitCSVTool.jar and details of this are available in the FIT SDK User Guide. There plenty of information about the Power required to pedal a bike on the web and also a nifty App available at BikeCalculator which is also available on the Apple store. So I've extracted the best data and replotted it. First thoughts are that the power is way too high. Then I realised I needed to compensate for my acceleration during the run. 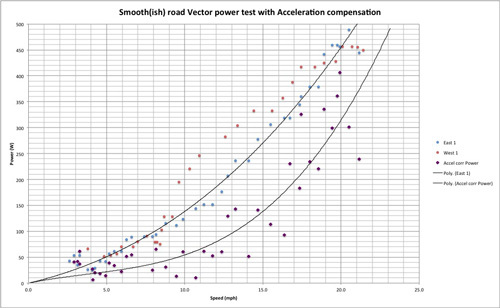 The compensation isn't brilliant but with data logged at only 1Hz what can you expect. At least it put the data into the right place. I've also taken the liberty to add a third order fit. If I now overlay the theoretical power, the dashed brown line,it all looks a lot better. 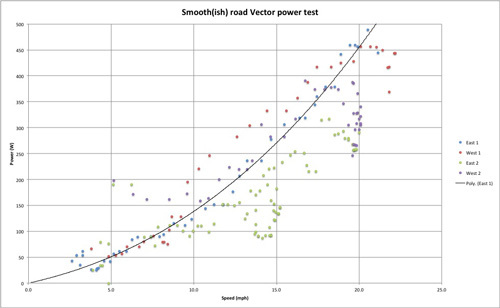 What this did prompt me to do was plot the Iso power and torque lines on speed and gradient axes. 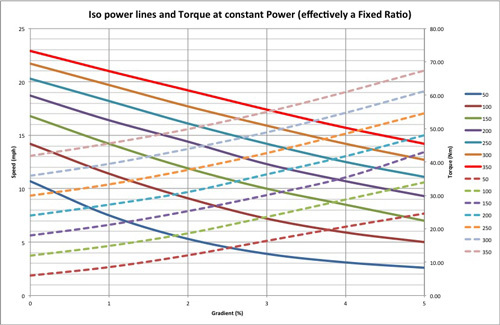 What this basically shows is that if you don't have much torque in your legs then you need a large ratio spread.